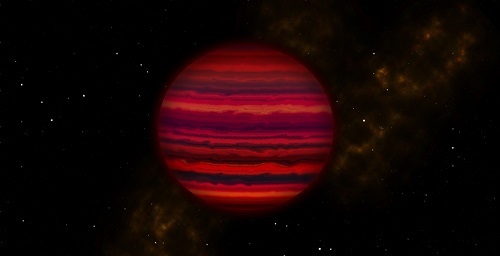 Artist’s conception of how WISE 0855 might appear if viewed close-up in infrared light. Artwork by Joy Pollard, Gemini Observatory/AURA. WISE 0855 was discovered by Kevin Luhman of Penn State in 2014 using data from NASA’s Wide-field Infrared Survey Explorer (WISE) satellite. WISE 0855’s relatively close proximity – it’s only about 7.2 light years away, the fourth closest extrasolar object to the Sun – provides an advantage in capturing the object’s miniscule glow; however, it is still remarkably difficult to observe. “It’s five times fainter than any other object detected with ground-based spectroscopy at this wavelength,” said Andy Skemer of the University of California Santa Cruz. “Now that we have a spectrum, we can really start thinking about what’s going on in this object. Our spectrum shows that WISE 0855 is dominated by water vapor and clouds, with an overall appearance that is strikingly similar to Jupiter.” Skemer is first author of a paper on the new findings to be published in Astrophysical Journal Letters and currently available online. Observations for this work were made using the Gemini Near-InfraRed Spectrograph (GNIRS) which is mounted on the Gemini North telescope on Maunakea in Hawai‘i. The research team, and Gemini staff, are grateful to be able to observe from Maunakea, Hawaii’s highest peak, where conditions are ideal for these types of observations.